Westside is a mid-rise condominium by the same developer who built Tribeca just down the street. These modern condos feature hardwood floors, granite counters and some have garages and soaring ceilings. Building amenities include a pool and fitness center. 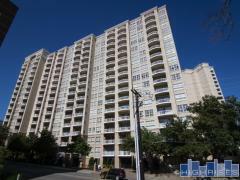 Have any comments or questions about Westside Condos? Ask your question and/or share your thoughts about this Building. I'm a resident here and I'd love to know who made/installed the cabinets. I want to see if it's possible to get this material to build a table that matches perfectly. Thanks!